Pix #1 has Stone in it. He is the one with out a shirt. I am in the white T-shirt. This is just out side gate at Delta 1, we are returning from the ville. Think we had gone in for lunch with Village chief. Pix #2 is a picture of new front gate bunker under construction. 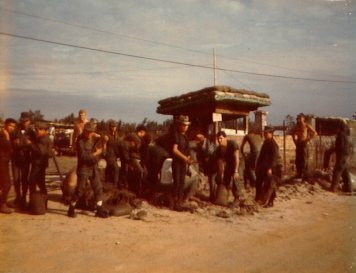 Note Marines and ARVN's working side by side. Imagine that, haha. Dennis is in back ground , no shirt red hair. This is Delta 1 and that is Hyw one in the foreground. Sorry about quality of pictures. Thirty years old and getting older.